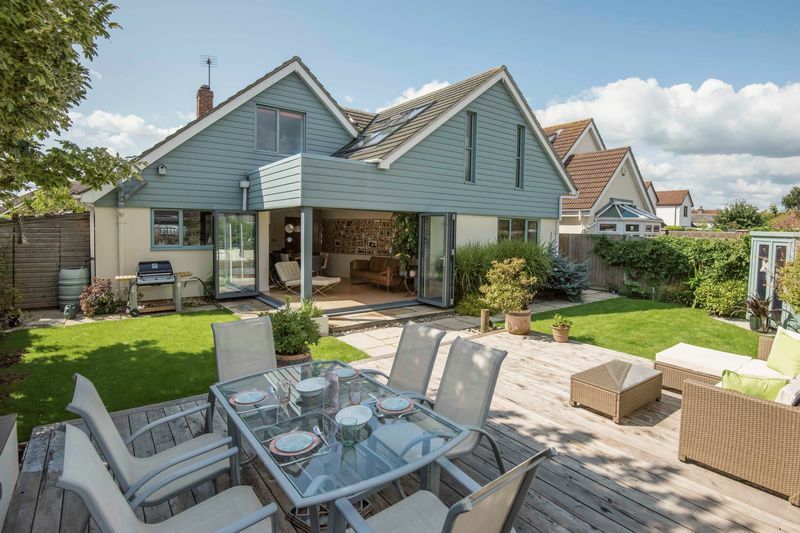 An exciting opportunity to acquire this contemporary, architect designed and individual home situated in a highly desirable location with Solent & Isle of Wight glimpses. 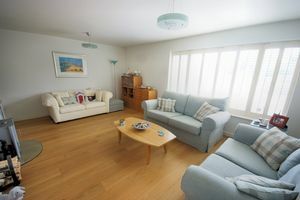 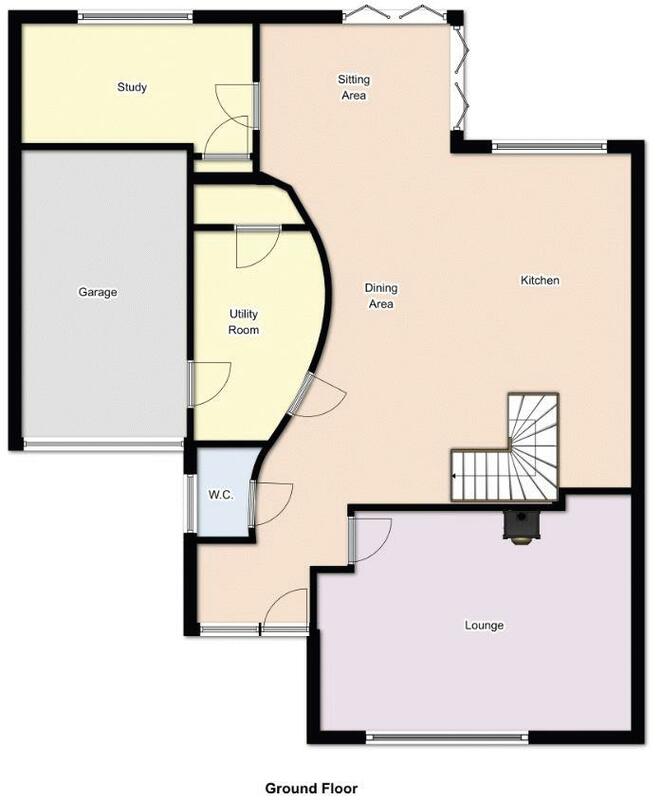 The current owners have re-designed the layout to create an inviting, light and spacious home. 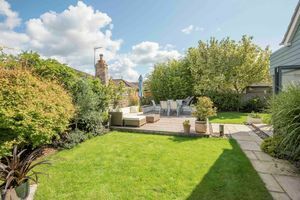 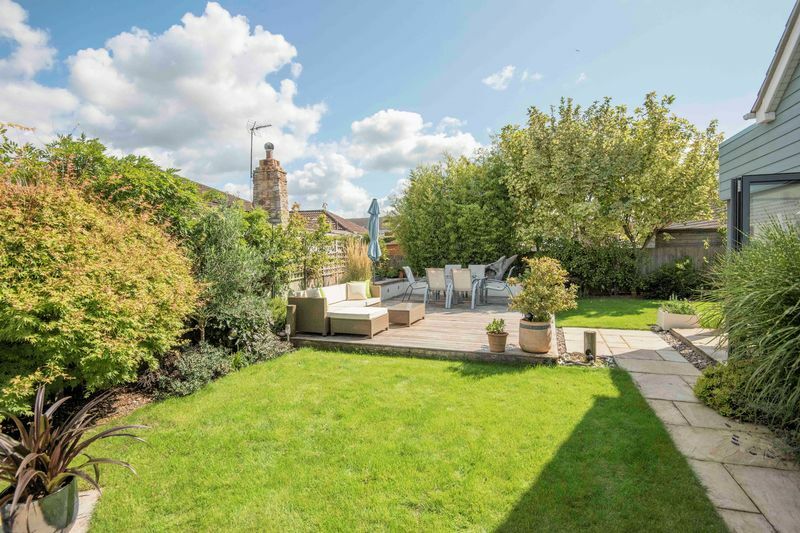 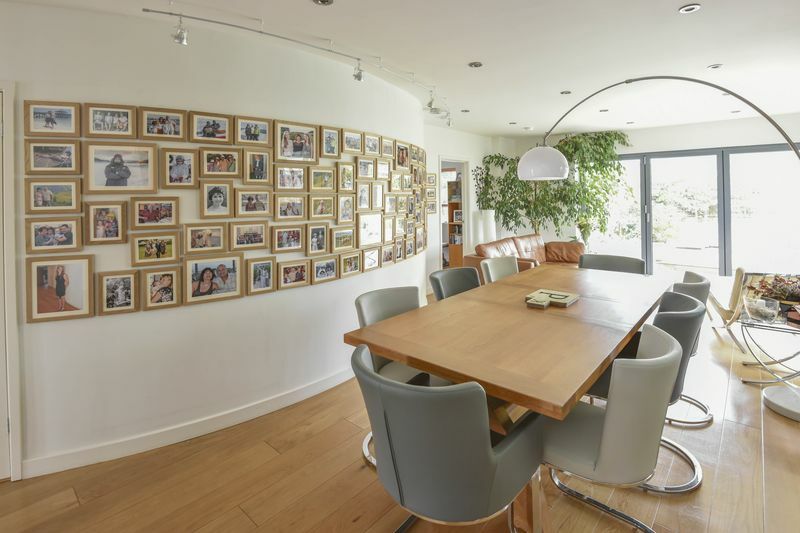 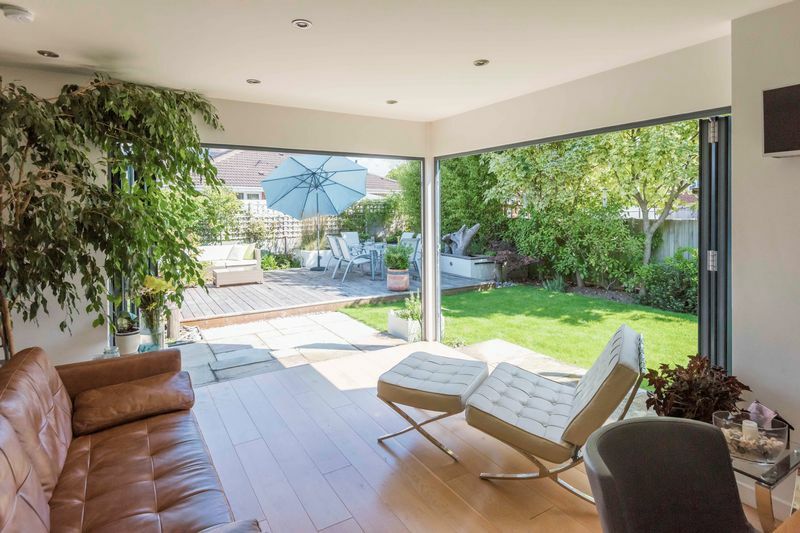 With four/five bedroom this spacious home boasts an impressive open plan entertaining area that flows into the landscaped gardens through twin sets of bi-fold doors. Further features include wood log burner, underfloor heating, air ventilation and cleverly designed feature walls. 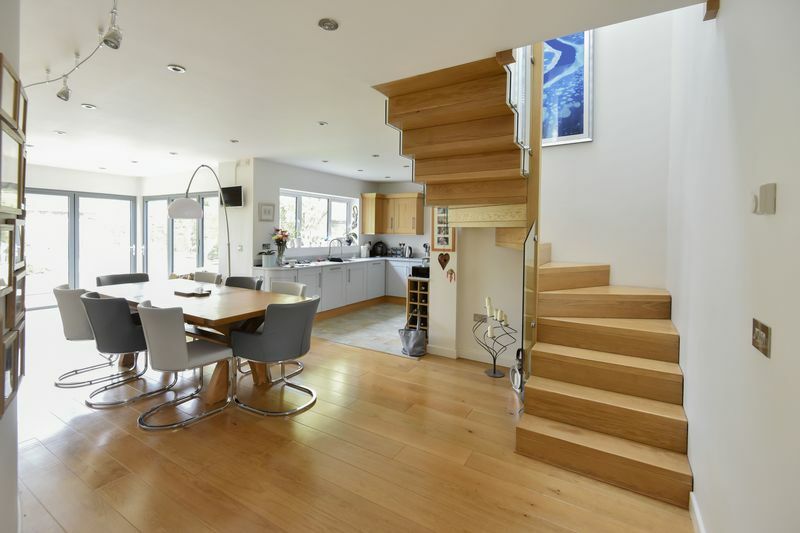 Frosted window, flat ceiling, engineered oak wood flooring, inset LED spotlighting, feature oak staircase with contemporary glass sides. 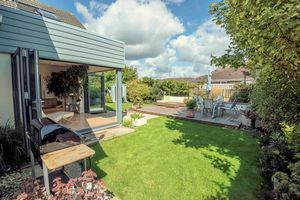 An impressive living space which is ideal for entertaining with feature curved wall, dining area and sitting area with two sets of bi-folds doors leading to the garden. 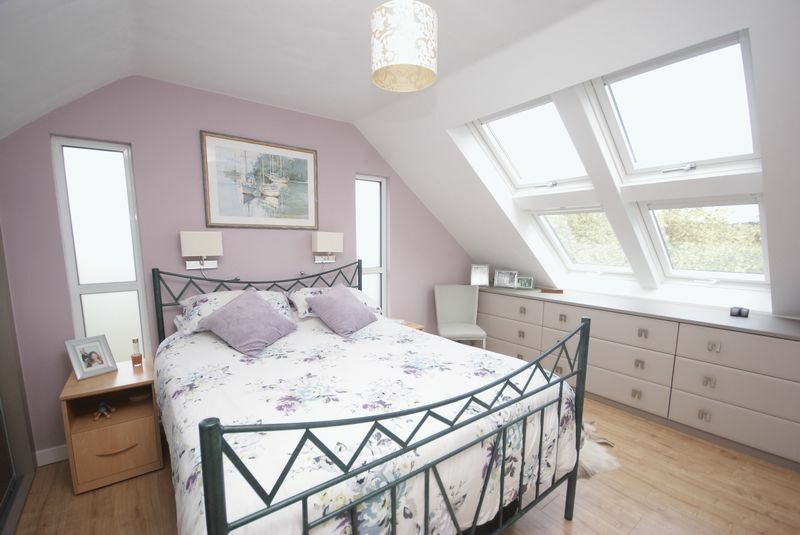 There is inset LED spot lighting, smoke alarm and underfloor heating. 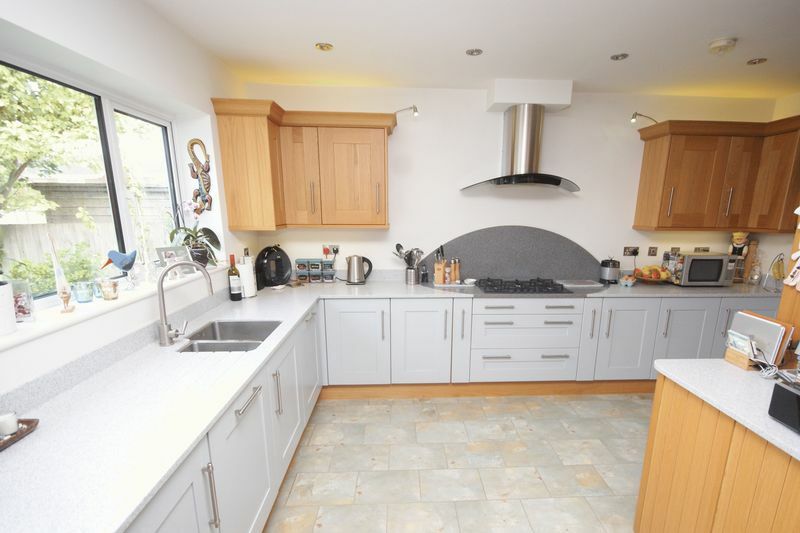 Custom built with a range of base cupboard and eye level units, Corian worktop over, SMEG five ring gas hob, two integrated electric ‘Neff’ ovens, pull-out larder unit, waste cupboard, ‘Neff’ integrated dishwasher, integrated fridge and freezer, tiled flooring, smoke alarm, under unit lighting, double glazed window to rear elevation. 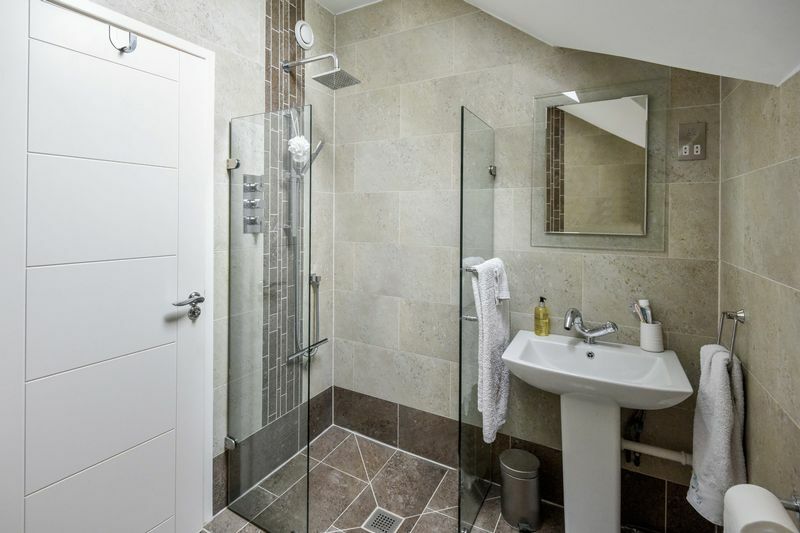 Obscured double glazed window to side elevation, close coupled W.C, wash hand basin set in vanity unit with mixer tap, tiled splash back, engineered oak flooring. 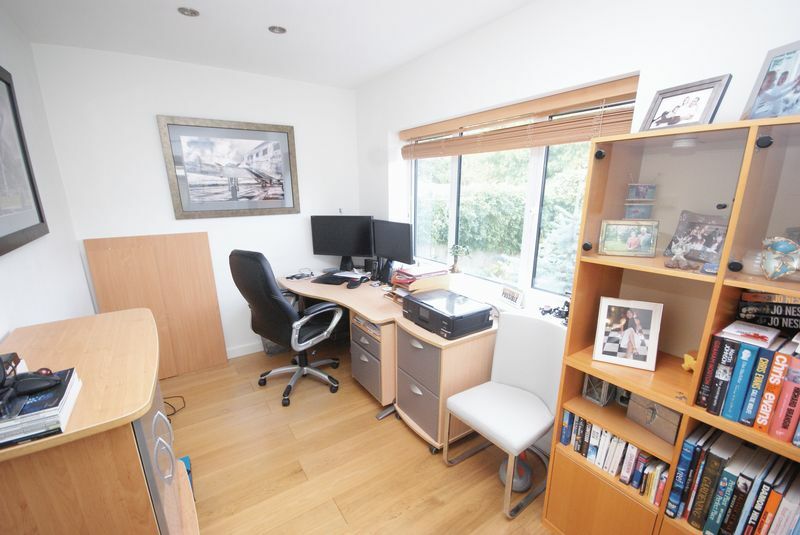 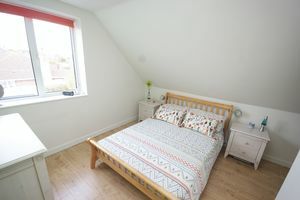 Light and spacious room to the front of the property with feature wood burner, flat ceiling, double glazed window to front elevation, continuation of engineered oak flooring. Flat ceiling with inset LED spotlighting, double glazed window to rear elevation, continuation of engineered oak wood flooring, storage cupboard with shelving. Flat ceiling, fitted with a range of base cupboard and matching eye level units, drawer units, recess and plumbing for washing machine, stainless steel sink unit with mixer tap, integrated fridge and freezer, continuation of engineered oak flooring, storage cupboard housing electric meter and shelving, courtesy door to integral garage. 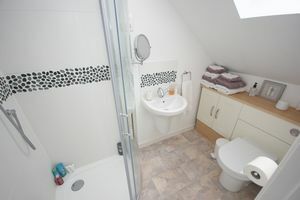 With remote controlled up and over door, wall mounted combination boiler, power and light connected, consumer unit to wall. 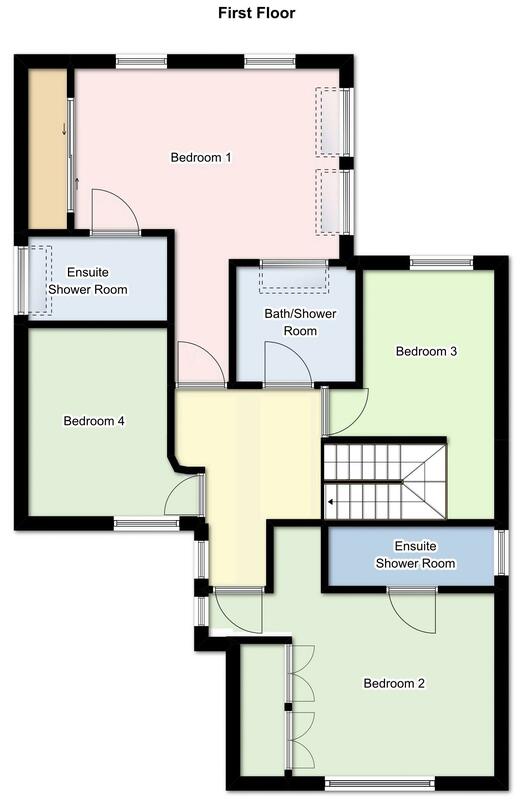 With Velux window, inset LED spotlighting, smoke alarm, laminate flooring, double glazed window to front elevation. Close coupled W.C with concealed cistern, wash hand basin, shower cubicle with mains shower, Velux window. 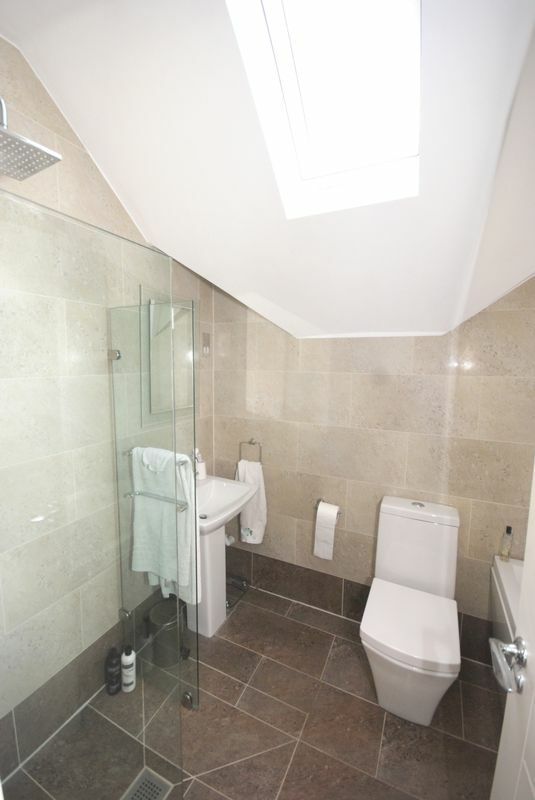 Flat ceiling with inset spotlighting, Velux window, close coupled W.C with concealed cistern, pedestal wash hand basin with mixer tap, tiled splash back, shower cubicle with mains shower, extractor fan, ladder style radiator. 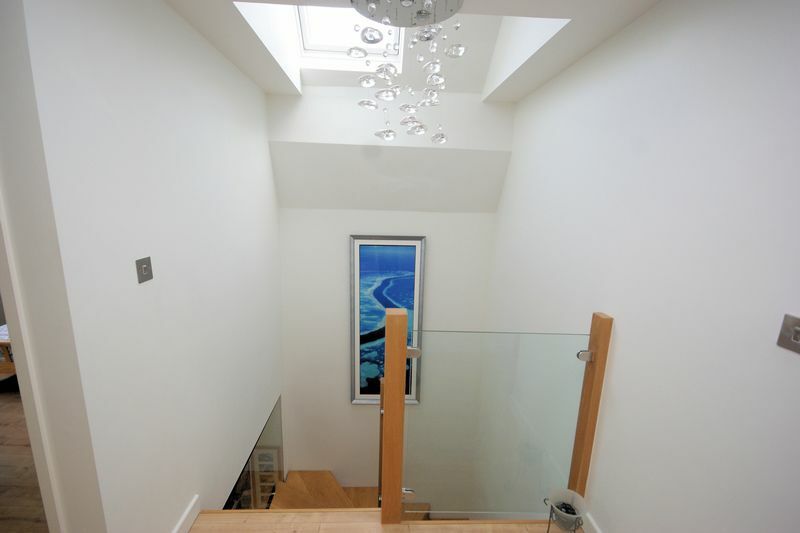 Flat ceiling with inset LED spotlighting, double glazed window to rear elevation. 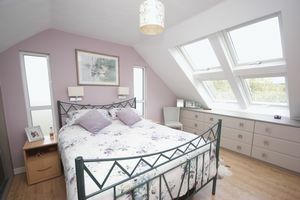 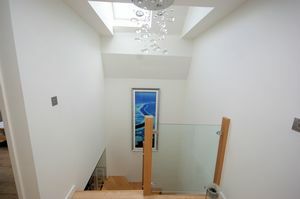 Flat ceiling with inset spotlighting, double glazed window to front elevation enjoying Solent & Isle of Wight glimpses. Wet room flooring, panelled bath with mixer tap close coupled W.C, pedestal wash hand basin, shaver point, mains shower with glass screens, extractor fan, inset spotlighting Velux window. 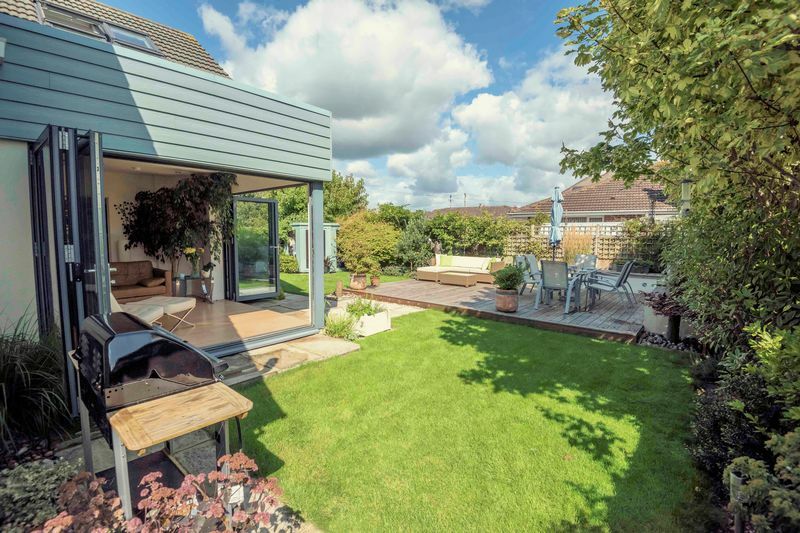 The rear garden is enclosed by panelled fencing with lawned areas, decking seating area ideal for alfresco dining, inset wall lighting and raised flower beds, two storage sheds to the side of the property, outside lighting, water feature, flowers and shrubs to borders, summerhouse, side pedestrian access via gate, outside water tap. 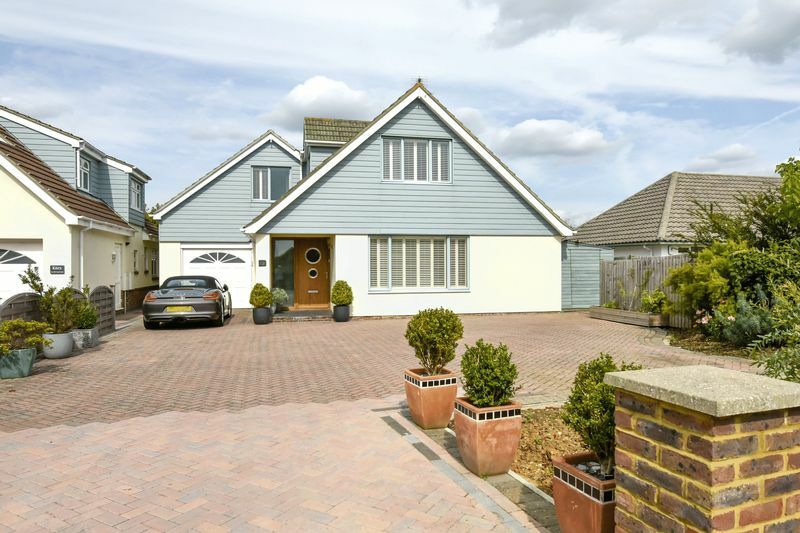 To the front of the property there is a blocked paved driveway providing ample off road parking and access to integral garage. 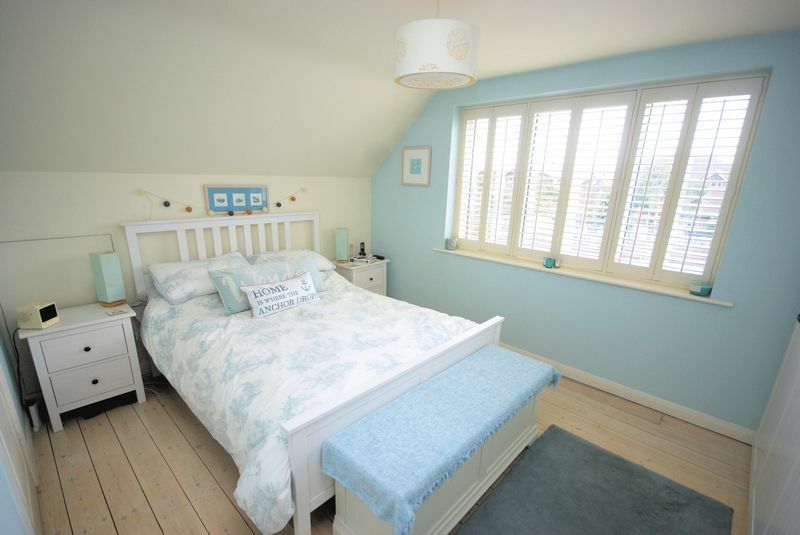 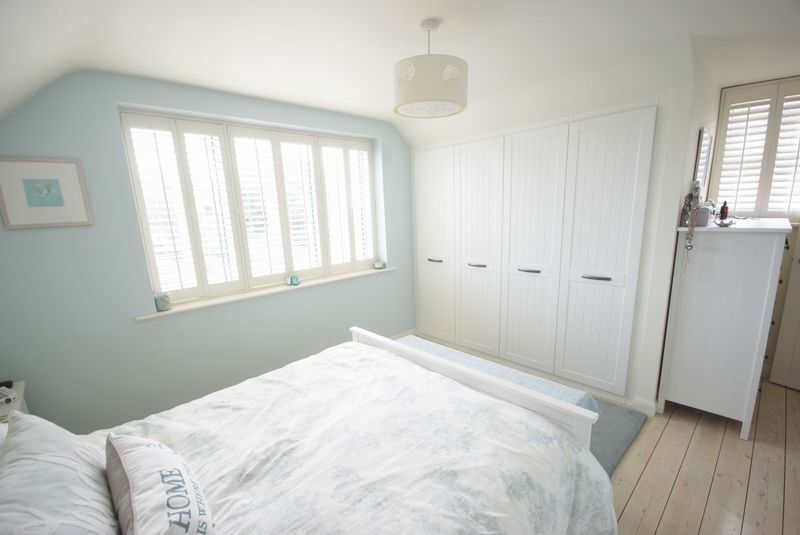 The property is fitted with a fresh air filtering system, wooden fitted shutters and underfloor heating throughout.